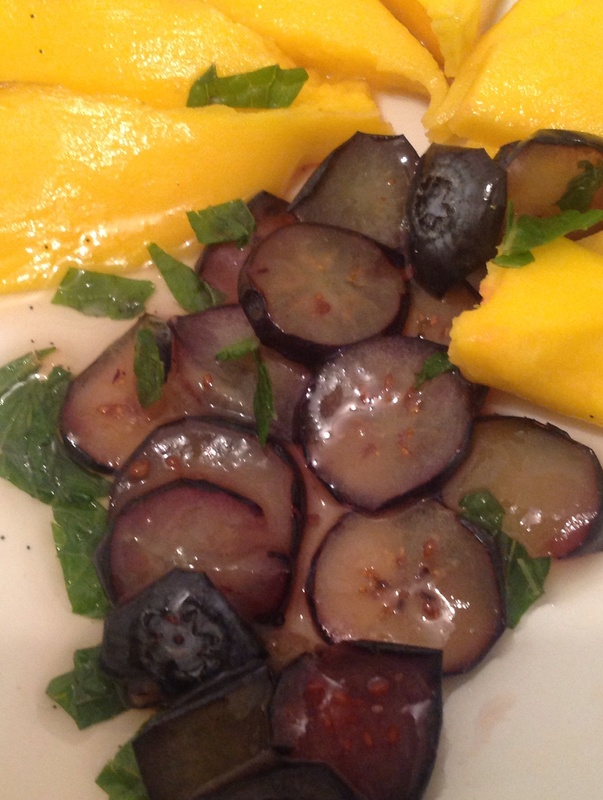 Blueberry, sliced with vanilla-pickled mango, in a salad. | ostrich milk. Study 3: Blueberry. Interval: How to slice blueberry. Blueberry only seem to come in two textures: whole, and a sticky mess. Mind you, whole blueberries are exciting; at their best, they explode in the mouth like sugary caviar when bit. But everything else just seems to be goo. Even simple pureed and filtered blueberries will quickly jellify in the refridgerator. Is that all the texture blueberry has not offer? This recipe slices frozen blueberries and allows them to thaw, using blueberry as an accent to mango. The sliced blueberry retains a fresh blueberry taste, while it quickly dissolves on the tongue. Process:Freeze fresh blueberries. Peel and pit a firm mango. (Slice the mango lengthwise around the pit. The two halves of the peel of a ripe mango should pull off easily.) Slice the mango into strips. The vinegar will be used to create a quick-pickling liquid which reduces to a gastrique or shrub. In a saucepan, begin to simmer water and vinegar over low heat. Add caviar from vanilla bean (slice bean lengthwise and scrape seed into mixture with knife). Add scraped vanilla pods. Allow to simmer without boiling for about 10 minutes. Raise temperature until mixture begins to boil. Allow mixture to cool to just below boiling and pour over mango slices in a bowl, completely covering mango. Allow mango to rest in liquid about 10 minutes. 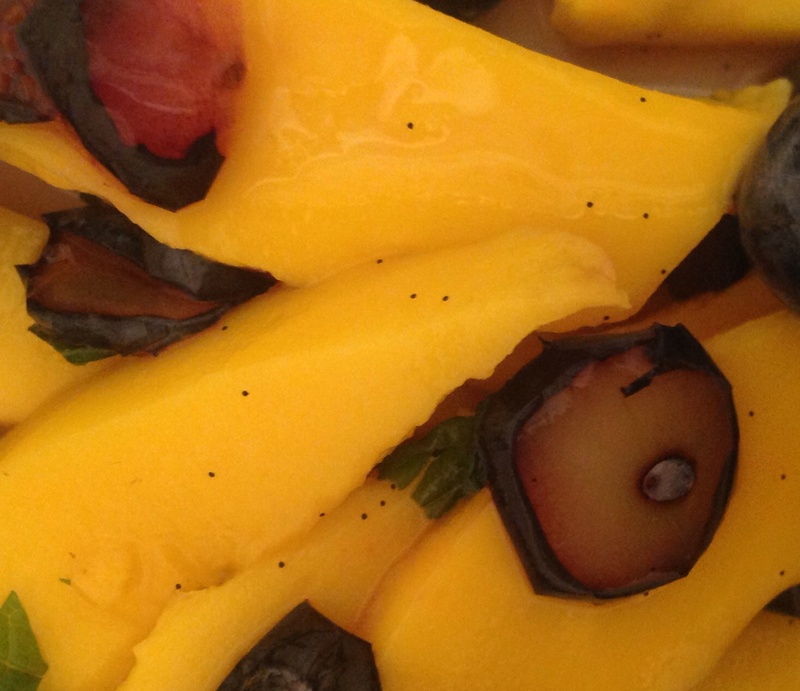 Reserving liquid, remove the mango and allow it to chill in refrigerator or ice bath. Return the reserved liquid to saucepan and reduce by about half, until it begins to thicken. For the blueberries, put on a Kevlar glove. (Really, get a Kevlar glove.) With a mandolin at a medium setting, and ensuring blueberries remain cold, slice frozen blueberries on mandolin. Plate mango and top with gastrique. Add sliced blueberries and garnish with mint. 1/2 of a vanilla bean. This entry was posted in Blueberry, Studies and tagged blueberry, frozen, mango, pickled, recipes, salad, sliced, Studies, vanilla, vinegar. Bookmark the permalink.